NOTE! The above GIF is for of the A series Explosion proof LED fixtures is for general description ONLY. The fixture is only available in Grey for the American market! Below is the actual fixture! These A Series, C1 D2 Explosion proof LED fixtures are available in 40W - 120W, 60W & 100W are stocked. A Series Explosion proof LED fixtures are designed for installations where moisture, dirt, dust, corrosion and vibration may be present, or areas where wind, water, snow or high ambient temperatures can be expected. These Hazardous location LED lighting fixtures are designed to be used in locations made hazard­ous by the presence of flammable vapors or gases or combustible dusts as defined by the NEC and IEC. A Series Explosion proof LED fixtures are ideal for replacing existing HPS/MH, offering higher efficacy for increased energy savings, lower maintenance costs and shorter paybacks. 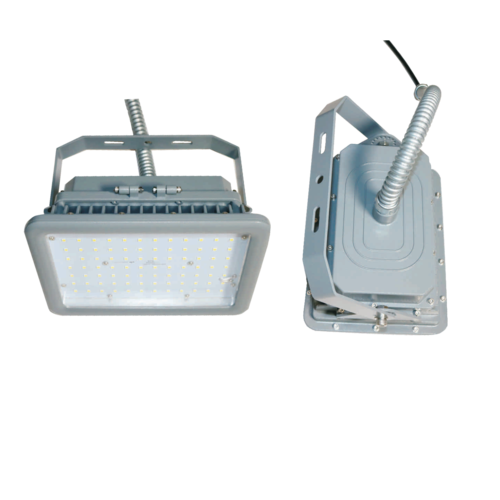 These outdoor Explosion proof LED fixtures offer energy savings up to 70% and eliminate maintenance for years to come. If options, like the Jelly Jar, wire guard, Mounting Arms etc. are needed, click here for the list of available accessories, please contact us!